Anyone who has tried applying false eyelashes for the first time knows that it takes practice. There are many tips and tricks I wish someone might have shared with me. So here I am now sharing a few things I learned along my eyelash journey! Our Vida Cosmetics lash applicator makes life so much easier. It allows you to get really close to your lash line and firmly grips lashes without damaging them. I prefer this lash applicator style over the U shaped one. This one allows you to apply them from the side giving you a better view of the application process. As opposed to the applicator and your hand blocking your front view. 2. Measure & trim before applying. Not all false eyelashes fit straight from the package, some might be too long or have excess band, so you will need to measure them and cut it to size. Measure the lashes by placing them on your lash line. Make a mental note of where the false lash stops at the edge of your lash line, then cut the excess. When trimming your lashes you always want to trim from the outer edge not the inner corner. Many lashes will have excess band on both sides. You will need to make sure to Trim that off. This step is optional. Vida Cosmetics lashes already are designed to have a soft cotton band with a curve. Making this step unecessary. Add curve to your eyelash strip by either placing it around the barrel of a makeup brush, your finger, or toggle the lash band back and forth in a U shaped motion between both your fingers. The more curved the lash band is the easier it will be to apply. As it will mimic the natural shape of your eye. You may also want to curl your natural lashes. Especially if you have straight lashes that point downward. If you do not it will be very apparent that you are wearing false lashes. 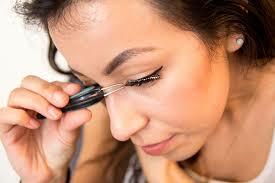 Curling them will also help prop the lashes up making them more visible and longer. When applying your favorite lash adhesive you want to apply a thin layer. you can add a tad bit extra on the ends since that is normally where your lashes may tend to lift. Once applied you need to wait about 20-30 seconds for the lash adhesive to get tacky. With some glue formulas it is easy to see when the glue is ready. For example the Duo clear brush on adhesive will begin to turn bluish. If your glue is not tacky when you go to apply the lash it will make the application process much harder. The lash will not adhere and it will move around. 6. Now to put on your lashes! Don't get nervous! You are doing great. And once this step is over you will be batting those long luscious lashes all over town! 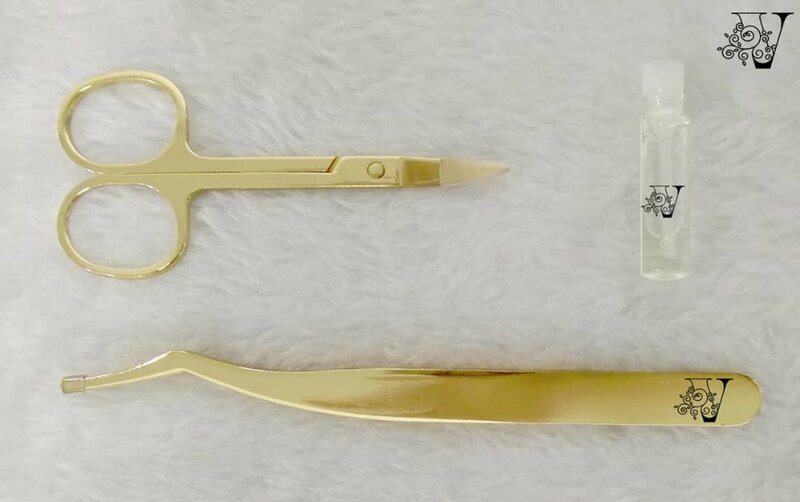 You want to take you favorite pair of Vida Cosmetic Lashes and make sure that it is placed securely on your Vida Cosmetics lash applicator tool. Approach from above placing the lash as close as possible to your upper lashline. I find that it is easier to attach the lash to the center of your eye first. Then you will attach the outer edge and finally the inner corner. It is a good idea to press down on the lash to make sure it is secure and stuck to your skin properly. You DO NOT want to stick the lash onto your natural lashes they need to be placed on the skin. As an additional step it is always good practice to blend your natural lashes with your falsies. This is achieved by taking your Vida Cosmetics lash tool and grasping both the false lash and natural lash and pinching them together. Do you see how easy that was? Now that you are a total pro you can go flaunt your Vida Cosmetic lashes. Share this blog with your BFF so you can both look amazing in your favorite lashes.